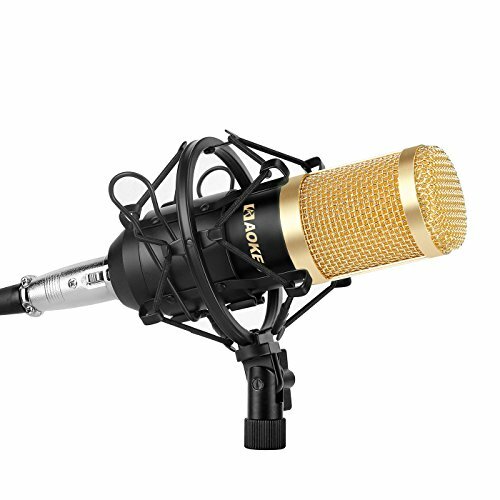 The set includes: (1) black professional condenser microphone + (1) microphone shock mount + (1) ball-type anti-wind foam cap + (1) microphone power cable. The professional condenser microphone adopts the exacting complete electronic circuit control. Capture rich, full-bodied sound from sources that are directly in front of the mic. The shock mount can effectively reduce handling noise. The ball-type anti-wind foam cap can protect microphone against wind interference and singers' spit. Note: Might require 48v phantom power and/or sound card please check your device to make sure it works properly . Equipped with super-diaphragm capacitance microphone core & cardioid polar pick-up pattern minimizes background noise and isolates the main sound source. Absolutely fulfill the requirement of high quality for broadcasting and recording. Come with durable shock mount to reduces handling noise. The anti-wind foam helps to protect microphone against wind interference and singers' spit. The professional condenser microphone adopts the exacting complete electronic circuit control. Capture rich, full-bodied sound from sources that are directly in front of the mic. 48V Power: Only works with device that could provide enough power of 5V. Connecting with desktop computer, it can be used separately; But if with laptop computer, need connect to electrical outlet or use a 48V phantom power supply to make sound much clearer and higher. 48V phantom power supply not included.